Imagine driving down along a narrow peninsula in brilliant sunshine with azure blue water on either side, finally arriving at a castle on a little island cut off from the mainland by a moat. 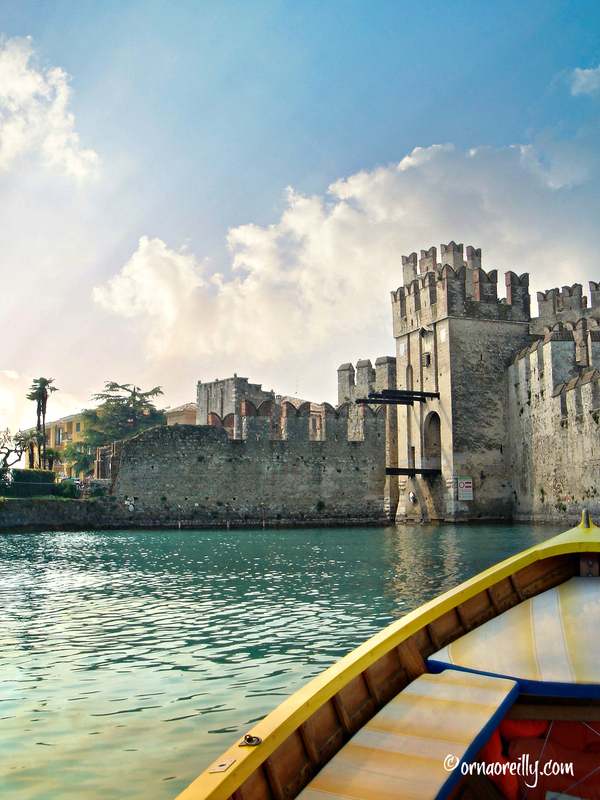 You have arrived in Sirmione, the Pearl of Lake Garda. Let’s park the car and take a look around. First of all, let me tell you a bit about Sirmione. It is on Lake Garda and located in the province of Lombardy in Northern Italy. 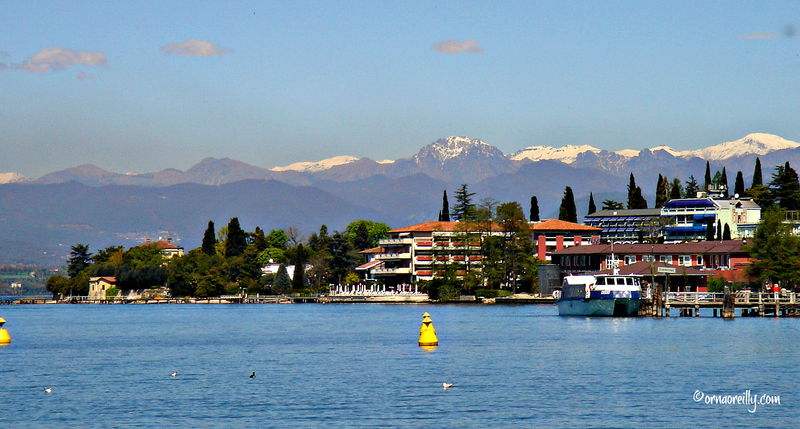 Lake Garda is the largest lake in Italy and is bounded by three provinces: Lombardy to the west, Veneto to the east and Trentino-Alto Adige to the north. I’m feeling nostalgic as I cross the moat. I haven’t been here since 2007 when I visited for the last time with my parents, now deceased. “We don’t do hills any more” my mother announced as she crossed her eightieth birthday. I travelled annually with my parents in their later years and was set the pleasurable task of finding the perfect place where they could walk to restaurants and take leisurely strolls without encountering a single incline. 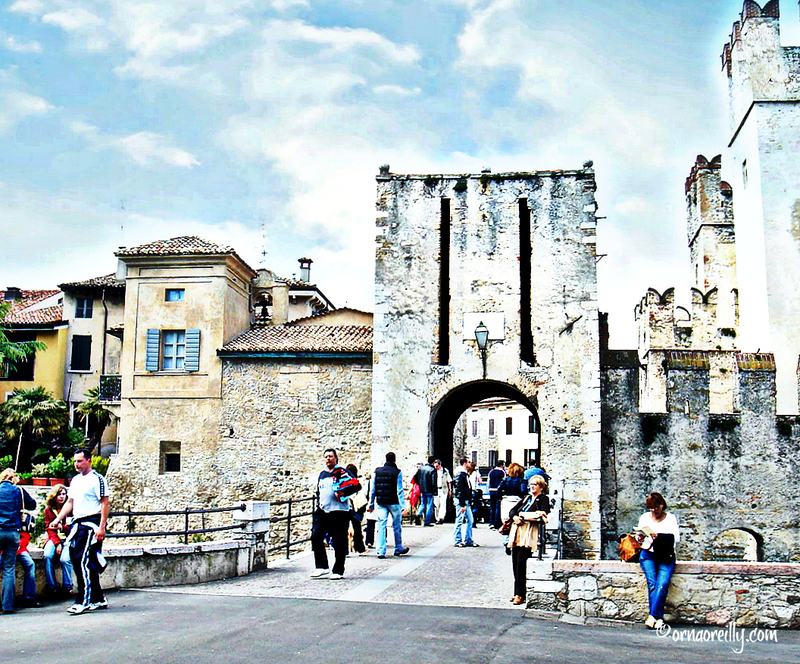 Sirmione in 2002 was the result. My parents loved it and for six consecutive years we visited. First of all, they loved it because it was, well, in Italy, and they could walk along the lake-shore, which – apart from being idyllic – was perfectly flat. 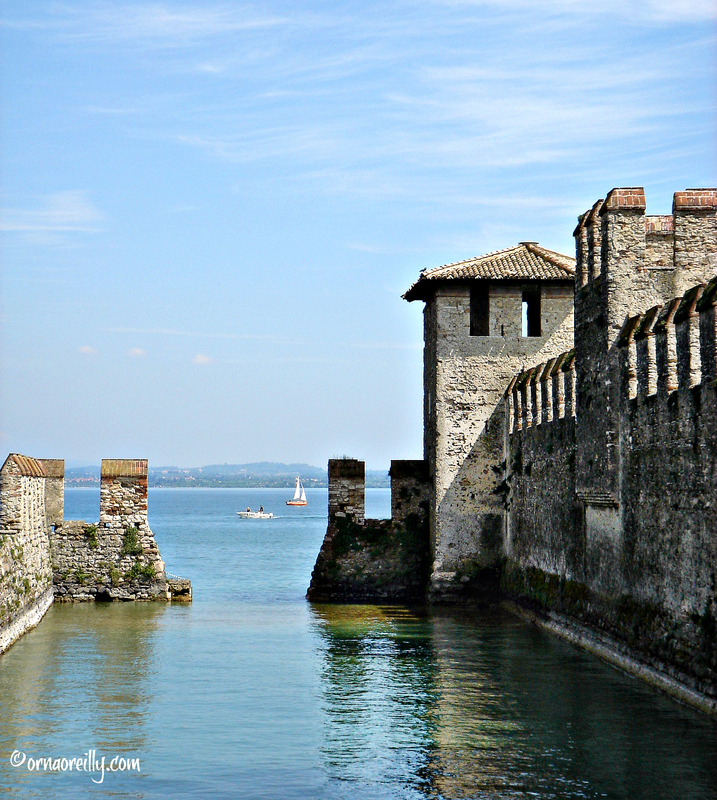 On our first visit we stayed at Hotel Sirmione across the moat at the Scaliger Castle and situated in the old town. I loved this friendly hotel and we stayed there on three occasions, changing to the Grand Hotel Terme, on the landward side of the moat, for the remainder of our visits. Every morning, on waking with the dawn, I would set out on a two hour walk down the peninsula to the residential area of Colombare and back. Then over the bridge at the castle, through the old town, where shopkeepers would be sweeping the cobbles outside their shops and locals would be tossing back their first espresso of the day, past Maria Callas’ villa to Sirmione’s main historical sight: the remains of an enormous Roman villa at the tip of the peninsula called Grotte di Catullo (Caves of Catullo). Then down the steps and back along the lake-shore, pausing at a small tabaccheria (newsagent) to get a newspaper before returning to the hotel. I managed to get to know the region pretty well. While the folks took forty winks after lunch, I regularly hopped onto a ferry and visited many of the charming towns which dot the lake-shore. On other days, I would take my leave after breakfast and jump on the train to nearby Venice or Verona. 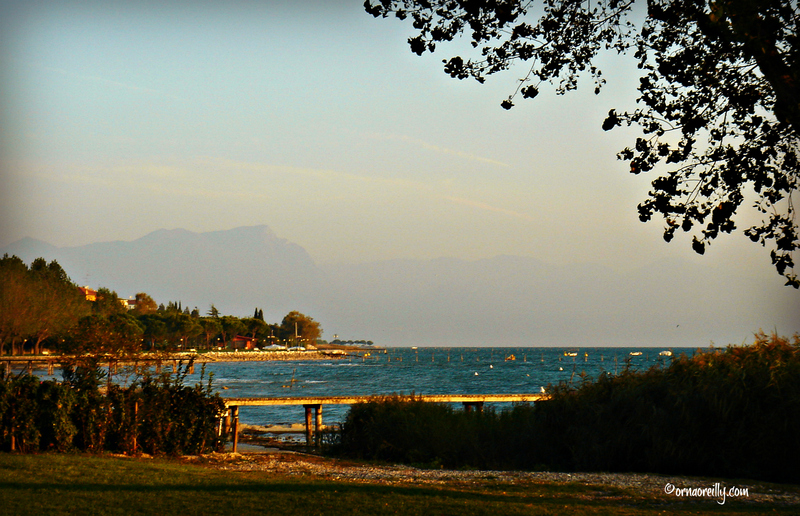 Sirmione and its peninsula are peaceful both in the early morning and evenings. During the day, however, it’s another matter. Ferry boats dock regularly disgorging thousands of visitors who head straight for the plentiful gelaterie (ice-cream parlours) and pizzerias which are all clustered in a narrow street beside the castle. They then lean against the castle wall enjoying their lunch and wander around the shops for a while. Sirmione’s delicious and colourful gelato is legendary! Many also climb aboard the tiny train to chug up the hill to the promontory to visit Catulla’s Caves. These are not actually caves, as when they were eventually uncovered, what emerged was the most important Roman villa in northern Italy. Or take a boat trip around the island. By late afternoon, luckily for those of us actually staying in the town, the crowds have dispersed and we have the narrow streets to ourselves again. Sirmione is also famous for its thermal springs, giving rise to its popularity among Italians who go there for the fango (mud) treatments. I had several of these at the Grand Hotel Terme, where I loved their spa with the great pedicures and massages too. Our absolute favourite restaurant was Il Grifone. Attached to its eponymous B&B and situated close to the castle, we loved to sit facing the lake. There was a tiny beach beside it where a huge swan stood cleaning its feathers most evenings, providing great diversion as we ate our artichokes and fresh fish. 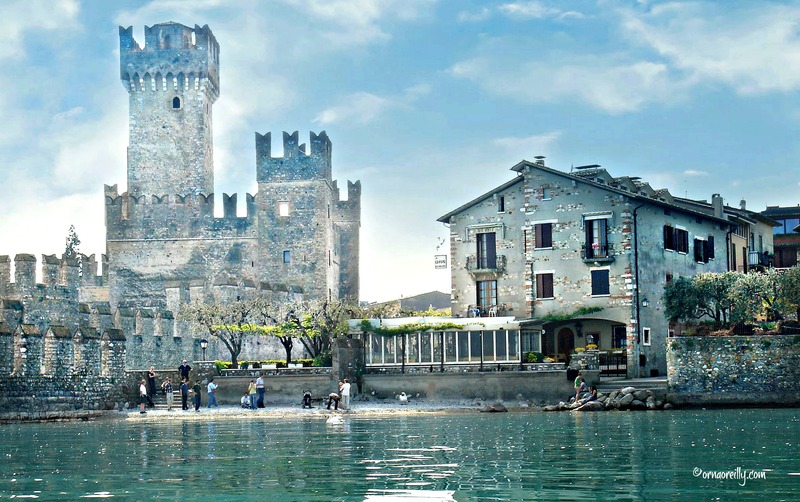 In fact, Sirmione played host to several famous poets, all of whom penned lines extolling the beauties of both the charming town and the “milky” lake. The influx of poets began with Gaius Valerius Cattulus in the first century BC, whose admirers arrived in their droves to pay homage. These included Alfred Lord Tennyson, Ezra Pound, James Joyce, D H Lawrence, Lord Byron, Goethe, Virgil and Dante, who apparently penned “The Inferno” there. The many Italian poets who stayed there included Gabriele D’Annunzio, the eccentric war-hero and lover of women, who created the Vittoriale at nearby Gardone and is well worth a visit. Maria Callas moved there in 1952 with her Veronese husband Giovan Battista Meneghini, and I loved to stroll past her villa imagining her sitting outside in the sun or admiring the lake from the little glassed in room on the roof. For me, personally, she epitomised the colourful character of Sirmione. I have always been intrigued by the life of this passionate, tragic soprano so it used to fascinate me to know that Sirmione was her favourite place to relax. Unfortunately, after she left her husband for Aristotle Onassis in 1959, she returned no more. However, I read that she often mentioned Sirmione as the place she loved to retreat to in times of stress. Now that I have told you all about my history with Sirmione, I will leave you to wander through this pretty town with its cobbled streets, overlooked by the 13th-century Scaliger castle. You will find several excellent gelaterie, pizzerias, boutiques and shoe-shops. I hope you enjoyed your visit to Sirmione. For my part, at the end of these magical visits, I was always sorry to leave the Pearl of Lake Garda. 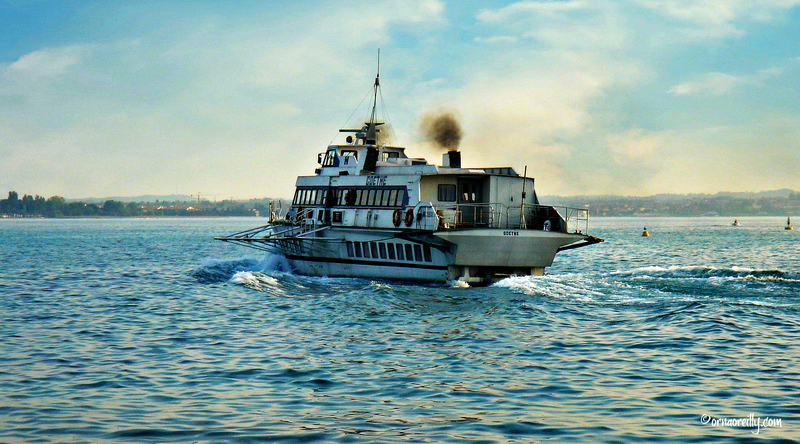 For details on how to get to Sirmione and more, click HERE. It looks stunning. I really do have to get to Lake Garda soon. Thank you so much for your wonderful article and pictures. We are going to Sirmione in September. I am now especially excited to visit here. 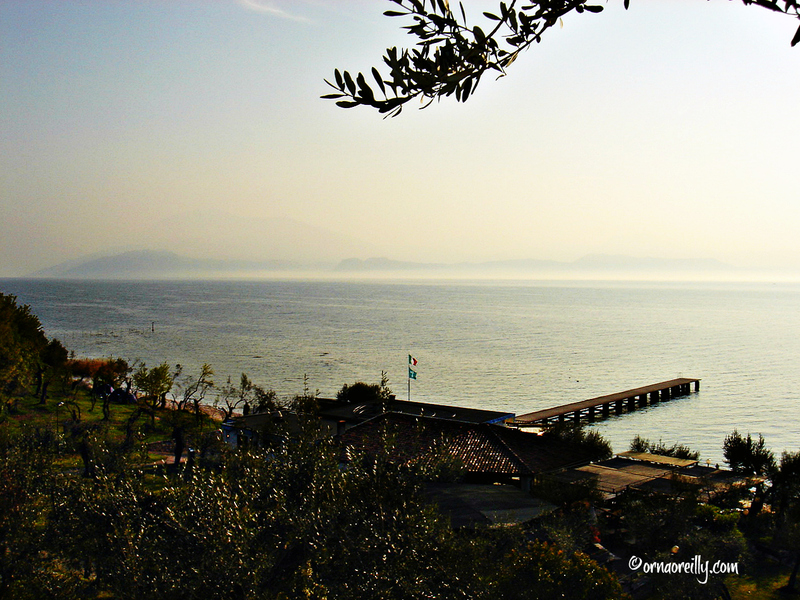 Nice photo essay on your memorable visits to Lago di Garda with your parents. I’m sure if they were still around today, they would be so proud of your travel writing and photography. To be sure, to be sure. That’s exactly what I was thinking, you’ve done your parents proud. Thanks for the introduction to another of Italy’s beautiful places. That gelato looks delicious! What a blessing to have had such great times with your parents. I agree with Tom. They’d be proud of you, but I’m sure they were then as well. Oh wow! 14 weeks you definitely got an amazing sense of place then. Beautiful! This makes me want to explore more of Lake Garda. Wonderful to have shared such lovely vacations with your parents – and a good reminder that you can enjoy an Italian vacation without the bustle of a big city or hills to climb. Thanks for this memory-filled look into a special place in Lombardy. Outstanding photos! Such great photos Orna. You’re an inspiration and Lake Garda looks grand! Beautiful article and photos! 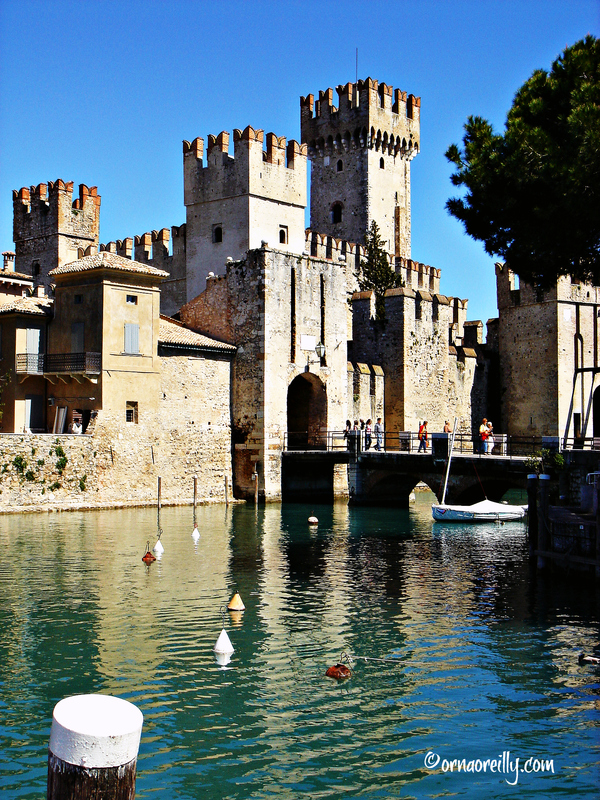 I often visited Sirmione on day trips when I lived in Vicenza many years ago. This fall, I’m going to stay there for a few days with some friends. Then we’re going on down to Puglia where I spent 10 days last year to scout out some places to take a small group. I have certainly enjoyed your articles on Puglia as well. I love Polignano a Mare, Lecce, and many of the other lovely towns that have such interesting histories…and am looking forward to returning.